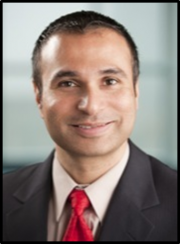 Site Principal Investigator – Cyrus Desouza, MBBS | Dr. Desouza is currently Professor and Chief of the Division of Diabetes, Endocrinology and Metabolism, Department of Internal Medicine at the University of Nebraska Medical Center. He is also the Director of the Diabetes and Obesity Program for the VA Nebraska-Western Iowa Healthcare System (NWIHCS). Dr. Desouza received his medical degree from St. Johns Medical College, Bangalore, India. He completed a rotating internship at St. Johns Medical College, Bangalore, India, senior house officer, internal medicine, Nair Hospital, Topiwala National Medical College, Bombay, India, residency, internal medicine, St. Barnabas Hospital, Bronx, New York, and a fellowship in the Division of Endocrinology, Diabetes and Metabolism at Tulane University, New Orleans, Louisiana. Dr. Desouza is a member of numerous professional organizations including the American Diabetes Association, American College of Clinical Endocrinologists, The Endocrine Society, and American College of Physicians. He currently serves on the National Professional Practice Committee of the American Diabetes Association. Dr. Desouza has authored and co-authored several articles in major journals and presented at national meetings.